An exuberant New Orleans ritual commemorates the friendship of escaped slaves and Native AmericansTHE beadwork on Donald Harrison’s final Mardi Gras suit depicts a naked Native American woman, her body dark red, holding a baby in each hand. He wore the suit to perform at Jazz Fest, an annual music festival in New Orleans, in 1998; he died six months later. One of the woman’s hands reaches upwards, the other hangs down. Behind her is a stylised pastoral landscape: sky, mountains, prairie and a river. Above her looms a snarling white face in three-quarter view, with red eyes, yellow bared teeth, pointed ears and a villainous moustache. Glittering stones representing tears fall down the woman’s body: she must choose which of her babies to save. Harrison called it his “Trail of Tears” suit, referring to the forced removal of tens of thousands of Native Americans from the south-eastern United States after the Indian Removal Act of 1830. Other Mardi Gras Indians pride themselves merely on being “pretty”—on having the most attractive, striking, eye-catching suit on Mardi Gras and St Joseph’s days—and that was important to Harrison too; he always looked correct when he “masked.” But he prized social commentary as well. He was a voracious reader, a passionate arguer, a labour leader among his fellow waiters, and he put himself into all his suits. As his daughter, Cherice Harrison-Nelson, says, “Suits tell stories.”And:The people who “mask Indian” tend to be working-class black New Orleanians. And as the names of the roles suggest, Mardi Gras Indian culture was traditionally an exclusively male preserve—“a warrior culture,” as Ms Harrison-Nelson calls it—though that is slowly changing. Ms Harrison-Nelson masks as the Big Queen of the Guardians of the Flame. While many groups start their parades from bars or taverns, last year her gang, which included several other women and a number of children, got permission to leave from St Augustine’s, a starkly beautiful Catholic church in Tremé built by free black people in the early 19th century. The dress is broadly, even generically, Native American; the suits are often complemented by huge feathered headdresses. The apparel derives not from the Choctaw, the Tunica, the Natchez or any of the other Native nations living around New Orleans, but from Natives of the Great Plains (noted for their broad headdresses). One theory is that New Orleanians became familiar with this look in the mid-to-late 19th century, thanks to travelling troupes such as Buffalo Bill’s Wild West Show. They may also have encountered it when, after the civil war, some freed slaves joined the army and met Plains Indians on the western frontier.Comment: A naked, dark red Native woman to portray the Trail of Tears? Headdresses copied from myth-making Wild West shows? Wow...that pretty much says it all. I guess "broadly, even generically" is a polite way of saying "falsely and stereotypically." Nothing about the Mardi Gras names, costumes, or customs represents genuine Indians. The celebrators may be celebrating genuine history, but they're doing so in false and stereotypical ways. 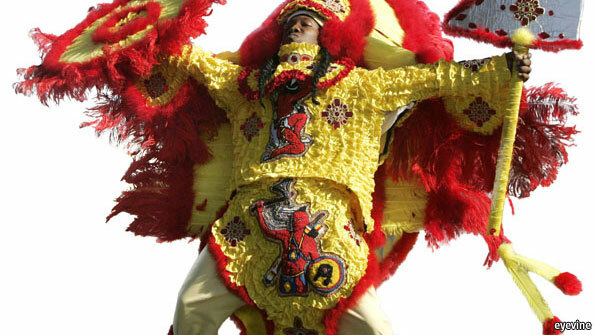 For more on Mardi Gras Indians, see Mardi Gras Costumes Get Copyright Protection and "Redskins" in Mardi Gras Costume. Below: A man in a "Chief Chicken" outfit brandishes a shield and a tomahawk. On his outfit is a red-skinned savage brandishing a shield and a tomahawk. Message: Indians are devilish killers. In any other case, this would be ugly stereotyping. In this case, it's ugly stereotyping.